In C, and other languages that can trace their lineage to C, comments start with a /* and end with a */. Anything inside is ignored by the language, allowing the programmer to describe what's going on. This is tremendously useful when reading other people's code or even your own code from the past. Another way of looking at it is that these /* and */ symbols mark the change of state between comments and code. /* says "After this is comment" while */ says "After this is code." Or to put it another way, */ means "Enough talk, time for action." I didn't have the tattoo done in the end. Describing what it meant would have taken too much explanation. Even if a fellow programmer recognized the symbol, they would probably first think it looked like I've been "commented out", as they wonder if I had the /* on the other side. Also, rotated a little, it looks a bit like a squinting cyclops. 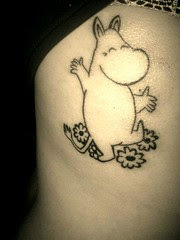 Picture Credit: Moomin Tattoo by Tiffany Terry.